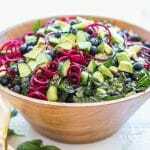 This superfood Kale Salad with Blueberries and Quinoa is a refreshing summer meal and a beautiful side dish to take to a potluck or serve at a dinner party. This salad was the first time I have ever spiralized beets– and I’m totally hooked. The delicate strands of beet are beautiful and fun to eat. While I am writing up this post, which I can’t wait to share with you, I am also packing to return to Malaysia for a while. We’ve been in the States several months, so it’s quite a task! One of my suitcases is entirely filled with toys and birthday presents for Xander — how traveling has changed in the past two years! I used to bring back a suitcase filled with almond butter and my favorite protein bars– now it’s dinosaur puzzles and train sets. I made this salad for a big family BBQ a few weeks back. It was a huge hit. The only problem? Everyone was picking the beet “noodles” off the top. I should have spiralized more! Even my 2 year old loves them. He eats beets roasted, but I wasn’t sure he would like them raw. Apparently spiralizing veggies is the key to making them appealing to adults and kids alike! Time to go weigh my suitcases and make sure I have them *just* below 50 pounds. And time to enjoy 1 last Mexican dinner! Asians just don’t do Mexican food well! I’ve also made this salad with cherries instead of blueberries. I imagine strawberries or raspberries would be just as delicious as well! Make it Paleo/Whole30: Omit the quinoa, or sub chilled cauliflower rice. This summery salad is packed with superfoods, with loves of texture and flavors. Cook quinoa per package ingredients, and cool. Add all dressing ingredients to a blender and pulse until basil is chopped fine. 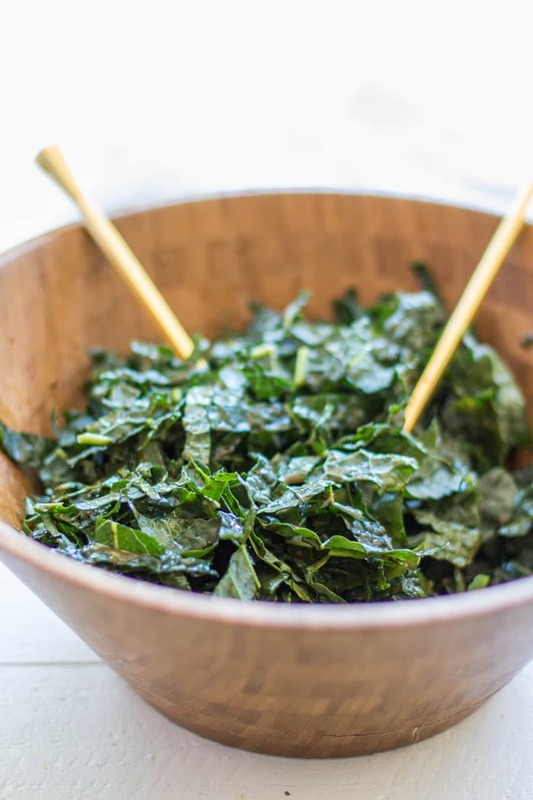 Destem and shred kale. Pour dressing on the kale, and massage dressing into the kale. Refrigerate while preparing the rest of the ingredients to allow to soften. Add the rest of the ingredients into the salad and serve. The salad is great on days 2 and 3 because the kale and beets stay firm and soak in the dressing. This post contains affiliate links, which means that if you click on one of the product links, I’ll receive a small percentage of any purchases made. 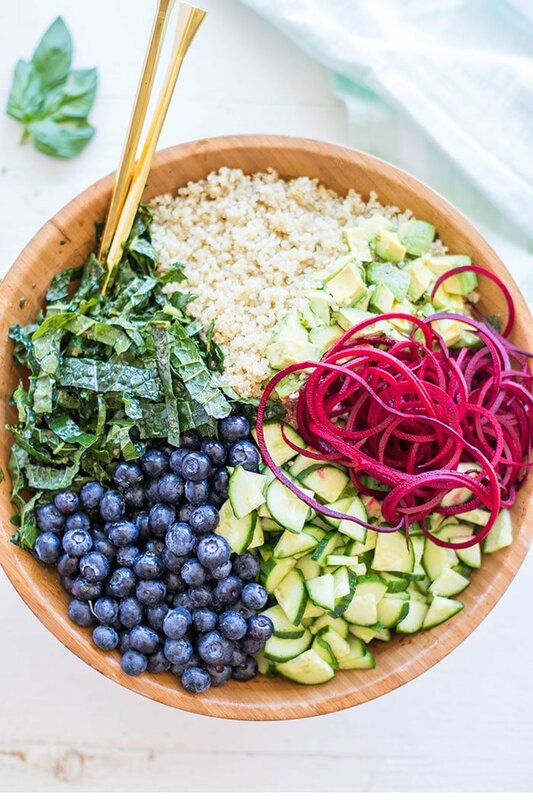 What a gorgeous and nutritious salad! 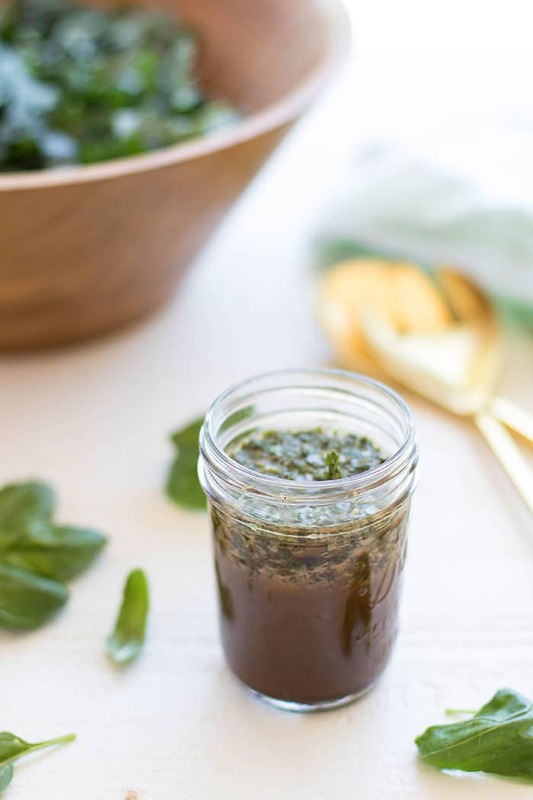 The dressing is almost exactly what I put on my salads everyday: olive oil, vinegar and salt. No bought salad dressings for my family! I think every age would devour this salad. It would be great for huge groups and potlucks. Safe travels! Thanks Ginny. It's a great salad -- full of all my favorites. What gorgeous colours. They are positively leaping off the screen at me. I've not tried spiralling beets, but I'm pretty sure I'd like them. They are amazing. And so much faster than just grating them for salads! Such a great and nutritious salad, I love everything about this salad! Love kale and blueberry combination. A perfect summer salad! This looks delicious! And so healthy. I'm always trying to get my husband to eat like this. Yum yum! Can a salad be any better for you? Such a pretty dish too. 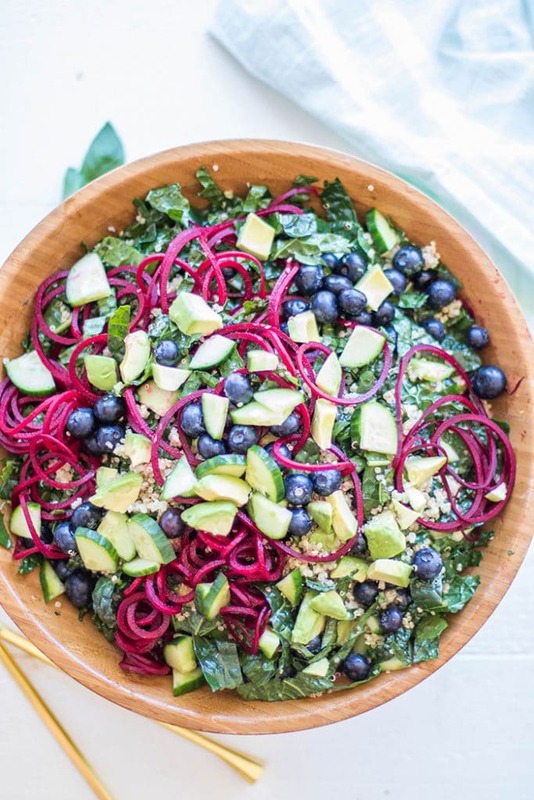 I just love the pop of blueberries with the kale! Perfect balance! Thanks Rebecca. I just haven't been able to get enough berries this summer :) On EVERYTHING! What a showstopping salad! I love the added blueberries. Thanks Kate! This salad is beautiful-- I've taken it to some BBQs and everyone picks the beet "noodles" out of it-- such a simple way to elevate a salad! Do you spiralize the beets cooked or uncooked? I spiralize them raw! They are so good like that. I hope you enjoy!